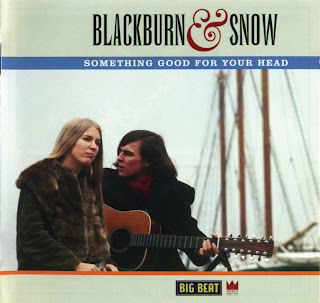 They hung with the Byrds, roomed with the Airplane and were as contemporary in sound and style as either of those groups when they got together in 1965, but the boy-girl folk-rock team of Blackburn & Snow has never had the kudos nor exposure they have so richly warranted until now. This, the second Nugget From The Golden State to be drawn from the legendary mid-1960s vaults of Frank Werber's Trident Productions puts the spotlight on the couple's marvelous unreleased recordings for the company. 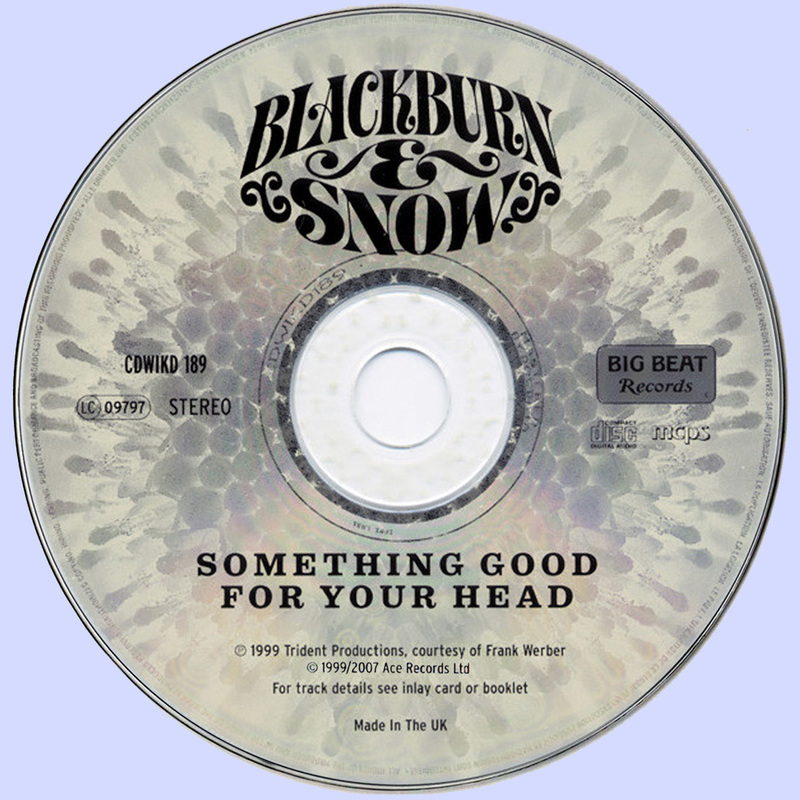 With Blackburn's strong material and Snow's clear, powerful voice, this release has the heady air of music history in the making. Songs like Yes Today, Takin' It Easy and Sure Or Sorry are surely amongst some of the most sensitive - and stunning - performances to come out of the entire West Coast mid-1960s milieu, but you are hearing them here for the first time. Politics and personality clashes meant the record was shelved, and Jeff and Sherry had parted, both professionally and romantically by the end of 1967. The 20 tracks of Something Good For Your Head include both sides of the rare Verve singles Time and Stranger In A Strange Land, the latter inspired by Robert Heinlein's classic sci-fi novel and penned according to legend by Snow's one-time paramour David Crosby. Also included is their unissued sessions for Trident-.-everything from stark yet compelling demos like Some Days I Feel Your Lovin' to the rocking It's So Hard and a great uptempo version of Ray Charles' Unchain Your Heart. Accompanying the duo on most selections are crack studio outfit the Candy Store Prophets, featuring Jerry McGee on guitar, later of the Ventures and one of the most respected country-style studio pickers of the era (lead guitar on the Monkees' Last Train To Clarksville for instance). The Prophets' performances alone lift the material into another dimension. 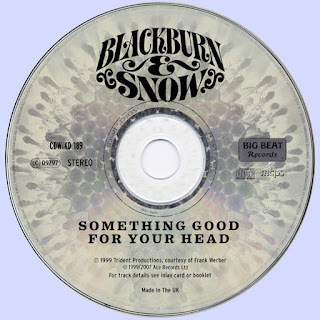 Members of Country Joe & The Fish and the Grass Roots formed part of Blackburn & Snow's road band and they were also involved in the sessions. Blackburn & Snow's Trident recordings have been legend amongst West Coast 1960s aficionados for many years, and this release, packed as usual with photos, memorabilia and an in-depth sleeve note makes a case for Something Good For Your Head as the great lost San Francisco 1960s rock album. You won't be disappointed. All songs by Jeff Blackburn except where noted. About Blackburn & Snow i only knew their song " Stranger In A Strange Land " that is on the somptuous (and essential in any collection) book and 4 discs compilation " Love Is The Song We Sing - San Francisco Nuggets 1965 - 1970 " but the rest of the album is better than I imagined. Beautiful vocals harmonies, fine guitar parts (most of the album is electric with guest musicians behind), really nice album tipical of this rich 60's period that reminds me early Jefferson Airplane, Serpent Power...certainly deserves to be recognized. So guys...don't miss this one. Thanks a lot for the discovery Marios, the original cd will be at home within the few days.